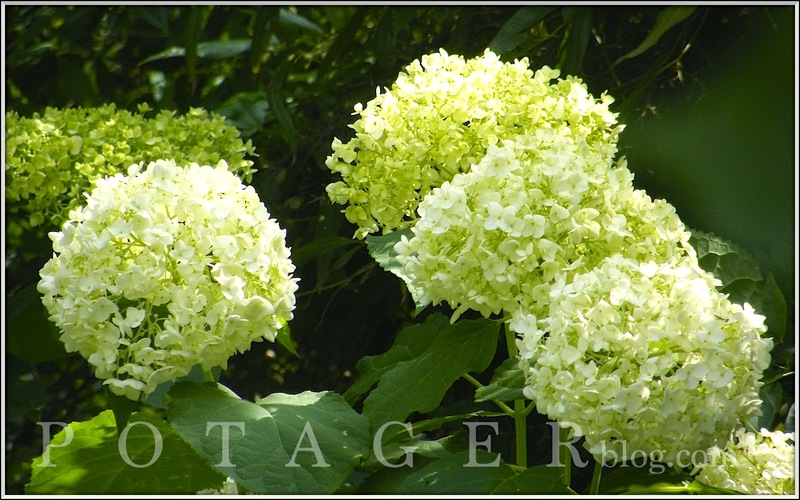 Because of our exceptionally cold and dry winter, my normal profusion of French mop head hydrangeas (as they bloom on old wood) is nonexistent this year. 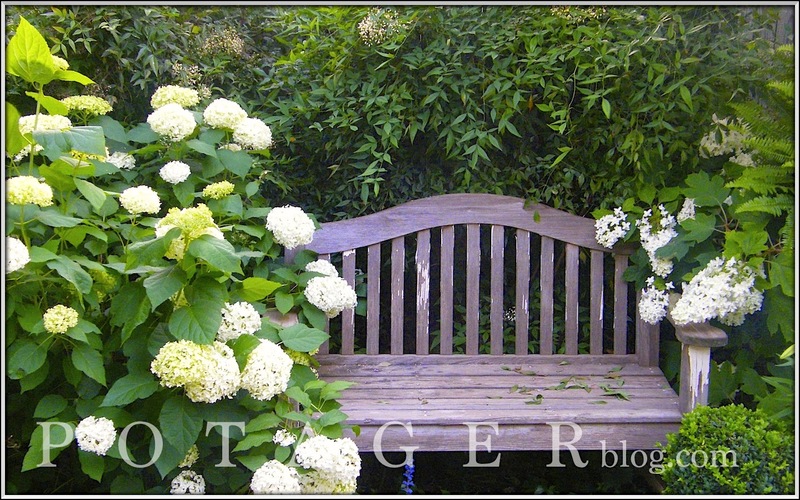 This makes my beloved 'Annabelle' hydrangeas (which bloom on new wood; find some here) that much more appreciated...that much more valued...in my garden and my vase. As I have been sharing with you, I've been cutting great numbers of long-stemmed 'Annabelles' to bring inside. I especially like them on my library table in the living room...their fresh white-limey green color lends a summery vibe to my white slip covered furniture. Together they lighten up what can sometimes be a dark room if I don't intervene in some way. 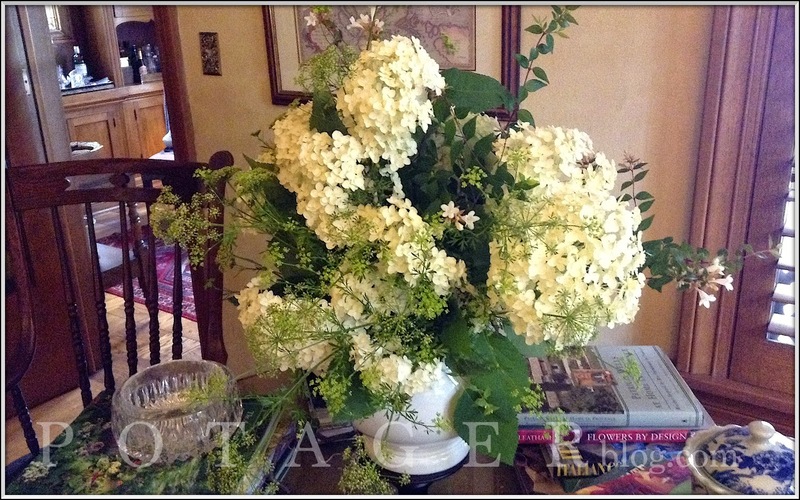 Large flower or plant arrangements are a staple in this spot...dictating the need for a large container/vase/receptacle of some sort...be it a tureen, cache pot, basket or bowl. So large that the great diameter of the opening in them inadequately supports long, heavy or lanky stems. Consequently, I must provide another means of support...a round of common chicken wire that is bent and molded to fit the circumference of the vessel and tucked inside. 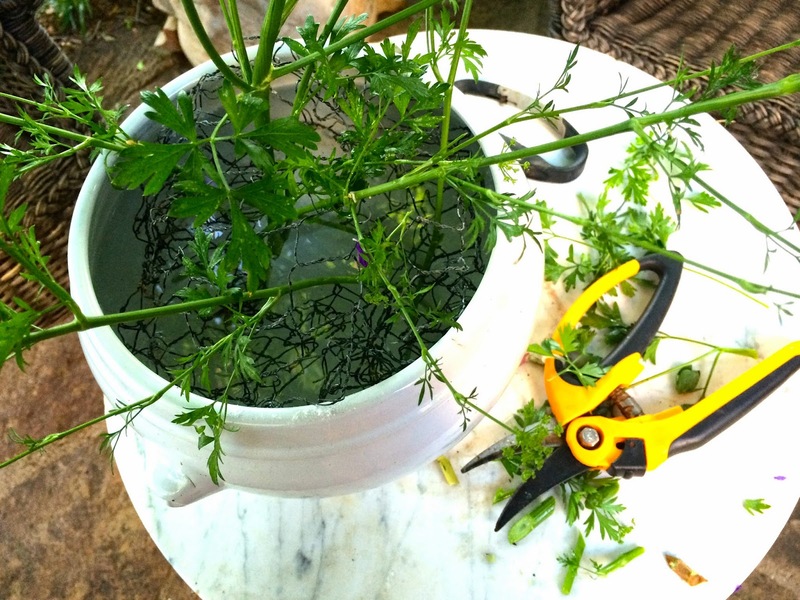 Stems and branches can then be coerced into a vertical, sideways or horizontal position with the mesh openings being a guide and prop for them. 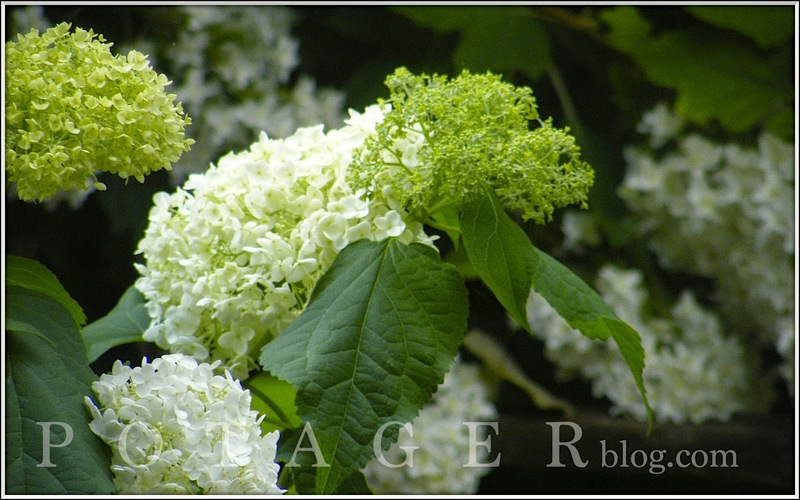 Filler and leafy branches are usually added first, with large blossoms and key floral components added last. until I recently read a wonderful biography of the enigmatic Constance Spry. Find the book here. Ms. Spry was a British educator, florist, author...contemporary of many early 20th century luminaries...Somerset Maugham, Gertrude Jekyl, Virginia Woolf. Her ground-breaking, innovative approach to floral design redefined what had become a formulaic, stodgy and uninspired domestic art. And yes, as you may have guessed by now...she introduced the use of chicken wire in floral design. And for that, I, and Annabelle, are extremely grateful.